NWI Investigative Group, Inc. is proud to announce our new VIDEO LINK system available for all clients. For those of you who receive case updates and reports via email, you will now also be able to view the video at your own computer by simply clicking on the SEE VIDEO link found in the VIDEO OBSERVATIONS section of the report. You will also be able to forward the report with the video link to co-workers, doctors, lawyers, or whomever you choose for their viewing or teleconferencing purposes. This new feature will allow you to view your video quicker and more efficiently, thus enabling you to manage your files easier, as the video and report will be together in one place. Please note that you do not have to download any software to your computer to use this feature. Your computer must only have some type of video player software already installed (i.e. Windows Media Player). This is a safe and secure website, owned and operated by NWI Investigative Group, Inc.
Below is a sample report with a video link. We invite you to try it out and let us know what you think. If interested, we will be happy to add you to our list of clients who already use it. To do so, please contact us via email at nwi@nwigroup.com, by phone at (800) 253-5990, or through your local NWI Marketing Representative. We hope you enjoy this added feature! Please find enclosed the results of our investigation on James Roberts. If you have any questions or concerns, please do not hesitate to call us at 1-800-253-5990. We thank you for assigning this case to us. We look forward to hearing from you again soon. NWI is committed to servicing our customers 7 days a week, 24 hours a day. Please think of NWI for all of your investigative needs. 1. Pick up Claimant at his place of employment, 10 Walnut Hill Park in Woburn, MA, to determine his activities after work. 2. Obtain video of Claimant active. 6. Contact Client at end of investigation. On Friday, May 16, 2003, Investigator conducted an afternoon surveillance at Claimant’s place of employment. Investigator determined Claimant was present and observed Claimant active. Investigator observed Claimant drive to a gas station, a convenience store and return to work. Claimant remained at his place of employment for the remainder of the surveillance. Investigator observed Claimant to be a white male, 30 years old, 6’0” tall, 185 lbs., with brown hair, wearing jeans, a polo-style shirt and eyeglasses. Investigator observed Claimant was not utilizing any visible medical aids or devices. Claimant walked with a normal gait. The weather on this day was warm and sunny. Investigator arrived at Claimant’s place of employment located at 10 Walnut Hill Park in Woburn, MA. Investigator observed the building to be a tan stucco, multi-level, multi-office building located in a residential/business area. 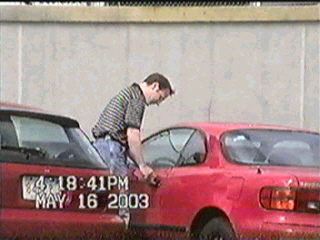 Investigator observed Claimant’s red Toyota Celica, MA Reg. 1872AD, present in the parking lot. Investigator established a suitable surveillance position across the street from the office with a view of Claimant’s vehicle and the doorway to the building. At 2:30 p.m., Investigator exited the surveillance vehicle and entered the building. Investigator observed Claimant at the reception area and confirmed Claimant’s identity and presence at the office. At 4:18 p.m., Investigator observed Claimant exit the office building, walk to the driver's side of his vehicle, and unlock and open the vehicle door. Investigator then observed Claimant enter the vehicle and depart the area. As Claimant backed his vehicle out of the parking space, Investigator observed Claimant turn his head to view behind the vehicle (See Video). Investigator observed Claimant to be a white male, 30 years old, 6’0” tall, 185 lbs., with brown hair, wearing jeans, a polo-style shirt and eyeglasses. Investigator observed Claimant was not wearing any visible medical aids or devices and walked with a normal gait. Investigator initiated mobile surveillance. At 4:23 p.m., Investigator observed Claimant arrive at the Getty gas station on Washington Street in Woburn, MA. Investigator established a surveillance position across the street with a clear view of Claimant. At 4:24 p.m., Investigator observed Claimant position his vehicle in front of a gas pump, exit the vehicle, remove the gas cap from his vehicle and proceed to use a credit card to pay for the gas. Claimant then bent at the waist to reach towards his feet and appeared to fix his socks. Investigator then observed Claimant stand upright and proceeded to fuel his vehicle. Claimant was observed looking around while fueling his vehicle, showing no signs of pain or discomfort in his actions (See Video). At 4:26 p.m., Investigator observed Claimant replace the fuel cap and enter the driver’s seat of the vehicle to depart the area (See Video). Investigator resumed mobile surveillance. 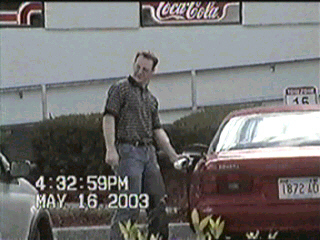 At 4:31 p.m., Investigator observed Claimant arrive at the Corporate Convenience Store located at 320 West Cummings Park in Woburn, MA. Claimant exited the vehicle, walked up the stairs leading to the door and entered the convenience store (See Video). At 4:32 p.m., Investigator observed Claimant exit the convenience store, walk down the stairs and proceed toward the driver’s side of his vehicle while carrying a bottle of water. Investigator observed Claimant briefly looking at another vehicle backing out of the parking position next to Claimant's. Claimant was shook his head as he entered the Toyota, backed the vehicle out of the parking position and departed the area (See Video). At 4:37 p.m., Investigator observed Claimant arrive back at the offices located at 10 Walnut Hill Park in Woburn, MA. Investigator observed Claimant exit the vehicle, kick his front tire, bend at the waist to place his water on the ground and then fix his socks. Claimant then stood upright, tilted his head back to take a drink of his water and looked up at something in the sky before walking toward and entering the office building (See Video). At 6:00 p.m., Investigator terminated surveillance and departed the area due to Claimant remaining within his place of employment. The weather on this day was warm and sunny. This case was completed on this day.